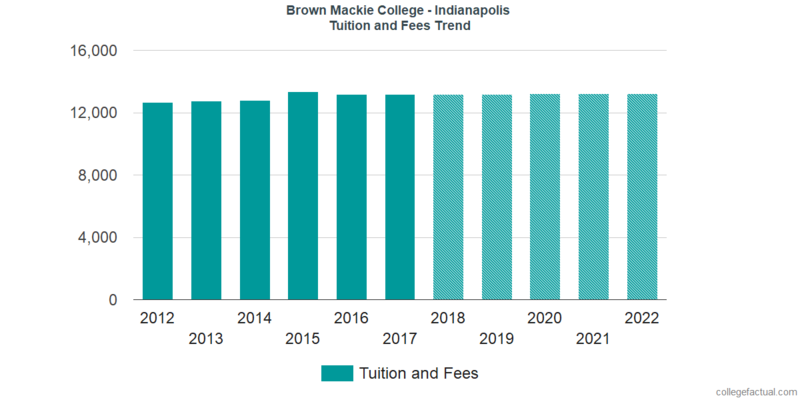 See current and predicted tuition charges for Brown Mackie College - Indianapolis, as well as how these costs compare to the U.S. average. Learn how fees and tuition at Brown Mackie College - Indianapolis match up to the average and learn how to effectively get prepared for potential tuition increases. For nationwide, regional and statewide comparisons, look at the table below to see how Brown Mackie College - Indianapolis measures up to other schools. How Much Will Tuition & Fees Be for Brown Mackie College - Indianapolis? In the 2017 - 2018 academic year, full time undergrads at Brown Mackie College - Indianapolis paid $13,176, before adjustments for financial need. $12,276 was the cost of tuition. The other $900 represents additional fees. Unlike public colleges, Brown Mackie College - Indianapolis does not offer a tuition discount to students who live in state. Tuition and fees cover the expense of attendance for one academic year, but don't include room and board, which will be an extra charge you will get if you decide to stay on campus. Then again, a lot of students wind up paying below full tuition after receiving financial aid and other discounts. The following table outlines the costs defined above for the 2017 - 2018 school year. See Brown Mackie College - Indianapolis cost per credit hour here. Brown Mackie College - Indianapolis tuition and fees have not changed substantially over the past five years. We estimate the cost of fees and tuition for this year will total $13,185. If costs continue to remain stable, two years at this school will run you $26,380 and four years will run you $52,796. In addition, you may have extra costs such as room and board, books and, transportation. Look at what upcoming tuition and fees will be for Brown Mackie College - Indianapolis students in the following chart. Pay attention to how much college fees and tuition is increasing every year. At most schools undergrads will end up spending more on their final year of college than they did for their first.